The so called "CDO dream" now pushed through with two additional stops: Bukidnon and Camiguin. Let me start with our first destination in our adventure down south - Bukidnon. From Manila we flew to Cagayan de Oro via Cebu Pacific - on a seat sale of course. On Lumbao Airport, around 7:30 AM, we were picked up by a van that we contacted ahead to take us to Dahilayan, Bukidnon where the longest zipline in Asia can be found. It is 840 meters long, and will allow you to fly 4,700 feet over the lush greens of Bukidnon. The shorter rides extend up to 340 and 150 meters. It will cost you PHP600 to ride all three. It seems long, but when you're nearing the end line you definitely would want more. The travel time (by land) from CDO to Dahilayan, Bukidnon is approx 2 hours. James was the only brave soul to try the Zorb where you will be strapped inside a rubber ball, like the one we usually see in Mall of Asia where people watch you as you roll over inside the giant ball floating on a pond. Of course, we cheered for him and supported him in this endeavor of a lifetime. :p It cost him PHP350 to roll down. For us who did not opt to roll down the hill, we rode buggies for PHP800 per vehicle. It is a two-seater ATV. There was a trek especially made for ATVs and buggies, and a guide riding an ATV whom you will follow. The trek was rough, and challenging. It was a fun ride and worth your money. It lasted for 20 minutes. Did I sound bias for the buggy vs the Zorb? After the activities, we had lunch at Forest Park Cafe. The price was not really cheap, but reasonable enough. Visit www.dahilayanadventurepark.com for more info. After the Dahilayan adventure, we went to Balingoan Port to ride a RORO ferry to our next destination - Camiguin. On the way to the port we stopped by a pineapple plantation to take some photos. It took us 2 hours to reach Balingoan port, and another 2 hours in the RORO going to Benoni Port of Camiguin. The RORO costs PHP130 per head (one way). So that was a total of 4 hours of travel time from Bukidnon to Camiguin. We rented the van for PHP4,000 - CDO airport to Dahilayan, then the van waited for us while doing activities at Dahilayan Adventure Park, and then Dahilayan to Balingoan Port. Contact person for the van transport service is Mr. Teo at 0922 446 2656. When we arrived in Camiguin, Ms. Aira and a van was waiting for us at Benoni port. They brought us to Villa Paraiso where we stayed for one night. The package we availed costs PHP1,295 per head inclusive of an overnight accommodation (2 rooms for the 7 of us) and an 8-hour tour (this includes the boat ride to White Island). The resort also offers free coffee all day. You can check them out at www.villaparaisoresortcamiguin.com. We arrived late in the afternoon and decided that hot spring was the best destination for the night to pamper our tired bodies. They brought us to Ardent Hot Spring. Entrance fee in the hot spring is already included in the package cost. It was a very cold night and the hot spring was very comforting. The tip is to stay at the highest pool as this is the cleanest because the water flows down. It really comes from natural spring. We played charades and 007PAK! and just had fun while enjoying the hot spring. After more than an hour we left and rode the van while dripping wet. We were too starved to go back to the resort to take a shower and change, so we went straight to a restaurant called Luna Ristorante for dinner. The waiting time was unbearable. We were wet, cold and hungry. But when the food arrived, it was worth the wait. Everything was delicious from burgers to pasta and pizza. My personal favorite was Linguine Oglio Alio, my own order, of course. :) The waitress tricked us that the pasta order is good for one only so we ordered one each. When we saw the plate, it was huge enough to fill two stomachs. But since I was so starved I was able to finish my plate, plus I tasted others' too. From then on I vowed to myself never to deprive myself of eating whatever and how much I want while I am on that vacation. It was definitely one of the longest days of our lives. After dinner, we returned to the resort, retired in our own rooms and called it a night. The next morning we geared up to explore what there was to explore. We planned to leave at 7AM, but the weather wasn't so cooperative so we waited. There were 4 complimentary breakfasts, so we ordered 3 more because there were 7 of us. The breakfast costs around PHP130 per order. It's a typical corned beef or ham with rice and egg. While having breakfast at the bar, the sun shone and we became really happy and hopeful. And so we hit the road, our first destination was the White Island. After an approx 15-min van ride we arrived at the beach where boats are waiting to take guests to the White Island. It was a very calm 5-minute boat ride to reach the infamous sand bar. We took pictures on the sand and under the water, we played with the cameras, we goofed around and then it rained. The rain did not stop and poured harder. We also got the chance to swim and snorkel, but there were not too many fishes nor corals. Then we decided to go back. But before that, I insisted that we try the sea urchin that the manong was selling. It was just PHP10 each, and it's fresh. He will open it in front of you, then pour vinegar, squeeze calamansi and it's good to go. I liked it. I wanted to bring some home, but that's a lot of hassle so I let the idea go. After White Island, we went to Katibawasan Falls. It was seriously cold already and the rain did not seem like it will stop anytime soon. 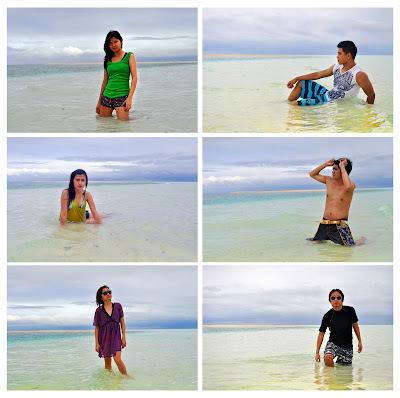 So we accepted our rainy fate in Camiguin and just enjoyed whatever we have. The falls was beautiful even without the aid of sunshine. We dipped in the water even though we were chilling so we can, again, take photos. The shirt souvenirs being sold outside the falls were cheap so grab the opportunity to buy some for pasalubong. And do not forget to try the giant cassava chips known locally as Kiping. I love cassava chips so imagine my delight upon seeing this giant plate-sized cassava chips, covered with latik. It costs only PHP15 for 2 pcs. After lunch, we passed by the Sunken Cemetery. You can cross to get to the big cross itself that serves as the marker, but due to the weather we decided not to take too long. It will cost you PHP10 to go to the cross via a small boat. At this point we were already shivering. Our last stop was the Ruins, and we took more photos. Around 4PM we went back to Benoni Port and once again hopped in the RORO ferry for PHP130 per head, and sailed for 2 hours to get back to Balingoan Port - our gateway to the CDO adventure! We played Pinoy Henyo to kill time. The category was anything related to our trip and we were so noisy and had so much fun. We made it to Balingoan Port by past 7 in the evening, and then looked for a van or bus to take us to Cagayan de Oro proper. We had quite a hard time looking for one. Thanks to our boys who did the hard part of looking for a vehicle and negotiating. I slept during the entire 1-hour van ride, while they are plotting a plan of how to fight the driver and the other guy sitting on the passenger's seat if ever they want to harm us. It was unbelievable hearing their plans. Thank God we arrived CDO safely, and their plans did not have to be put into action. We rode a jeepney to Divisoria where the lodge that we wanted to go to, 'D Morvie, is located. We did not book any room ahead of time, and all lodges were full. It was again a very exhausting chore looking for a place to stay while we carry all our bags. Finally, we found rooms at Three Sisters Dorm and Transient in Yacapin St. and decided to settle here. It has a common bathroom per floor, which I hate, and the rooms are small which was expected. We stayed here for 2 nights. It cost us around PHP800 per room per night, we took 3 rooms. Upon checking in, we immediately hit the streets of Divisoria and did some shopping, dinner, and promised to go back the next day for more shopping. The next day is the day we have been all waiting for - white water rafting day! Great White Water Tours picked us up at 7:30 AM and we rode with other tourists who will also try this one of a kind adventure on that day. When we arrived at their headquarters, all of us were briefed about the activity. The briefing was dead serious. What to expect, what to do, what not to do...every single word said was listened to carefully by everyone. About an hour of jeepney ride took us to the river where we will start the adventure. We geared up and we're ready to go. The feeling was unexplainable. It was of deep excitement, happiness, adrenaline rush, and fear at the same time. Great White Water Tours is the only rafting operator in CDO that intentionally flips the raft over for better adventure experience for guests. Since we started rafting, we were eagerly and nervously anticipating the first flip...and then it happened. It was a rush you'd never forget. We stopped by the river banks to take some snacks (juice and pastel) as we made it halfway the ride. We experienced about five flips total, estimate. One of those, the iceberg flip, got me trapped under the raft. Luckily, our guide was able to pull me out before I began to panic. It was the flip that made me say no to the succeeding flip attempts. We went through a total of 21 rapids, and about 4 hours of ride in the CDO river. The entire ride was just AWESOME. We laughed together, we fell together, we saved other tourists whose rafts flipped, we got scared together, we made it to the end of this wonderful ride together. One of the best things about GWWT is they have a photographer who also rides a raft and follows you to take good photos and videos. It is up to you if you will risk your camera being wet. Thanks to my very handy and adventure-loving Olympus Tough 3000, we had great photos and videos of this adventure. For more details you can visit their website at www.riverraftingcdo.com. That night we had dinner at CDO's very own version of Banchetto, and did some more shopping at the bazaars in the street. And then we capped off the entire trip with a drinking session at a bar called Bourbon St. where I got a free Cup of Love for the birthday that I just had. The next day we went back to Manila... tired, but fulfilled (and I lost my watch at the lodge, never to stay in a place with common bathroom again). You had a good travel around Mindanao. I am proud that I am from Cagayan de Oro and the tourist spot that you had visited. Thanks for visiting the town. Best regards! Gosh, I really envy your travel experience. Bukidnon-Camiguin-CDO that's 3 in 1. Seems you really had enjoyed a lot. I wish I could travel with my friends the same way you did Sure, it would be a lot of fun. Hi, may I know the total cost of your trip per head? thanks! Hi! We shelled out around Php7,000-Php9,000 each for the trip, excluding airfares. You're welcome. I'm happy you found this post helpful. Enjoy, and hope to hear about your own down south adventure too! Hi Monique, for how long did this whole trip take? We're also planning to do the same things. Thanks in advance. :) and btw, your blog is very informative. Inggit much...Do you have travel itinerary for this trip? Thanks! Hi, did you book a tour package for this? Can you recommend the tour operators?